As part of her regular-guy accessibility, Pink's rock star appeal hinges on the fact that she doesn't act like one so much as parties like one. True to form, on The Truth, our foul-mouthed, hard-drinking everywoman does the "Walk of Shame"; waxes sarcastic about "whiskey dicks"; and generally pours her guts out. But she does it over some of her most interesting songs. Sure, there are strutting anthems about relationships and weekends. 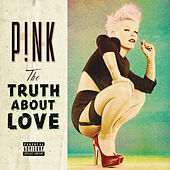 But there are also shivery duets ("Try"), malt-shop pop, stalking guitars and "Where Did the Beat Go?," a strange, sprawling mess that Pink sings the crap out of.